BrainLazy is an East Coast outfit, so while we haven’t missed a PAX East, PAX Prime has thus far eluded us. Naturally that’s something we would love to correct, and never has that been more true than now. You see, we just got a press release giving us the lowdown on what they have in store, and it looks like it will be a blast. Passes are sold out, so for most of you, this will be a tease. For those lucky few who are already set to attend, get ready to get excited. You can read the details below, but a keynote from David Jaffe and the awesome concert lineup alone are more than enough to make us wish we had a west coast office. You can learn all about the convention here. SEATTLE – June 28, 2011 – David Jaffe, of Twisted Metal and God of War fame, will kick off three days of demos, speakers, competitions and concerts by some of the biggest names in gaming. The panel discussions at the festival will take attendees through an exploration of the good, the bad and the quirky aspects of gamer culture guided by some of the biggest names in gaming. Fans will also see some of the hottest new games from more than a hundred exhibitors including video game companies like 2K Games, Activision, Bioware, Capcom, NCsoft and Turbine as well as table top/CCG power houses such as Wizards of the Coast and Privateer Press. Microsoft is hosting Halo Fest – the largest and most expansive live Halo experience anyone has ever seen – at the third floor annex of the Washington State Conference Center. 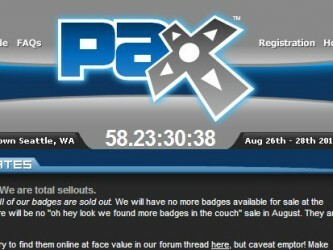 PAX Prime is scheduled at the Seattle Convention Center on August 26 – 28. Passes are completely sold out.